The wire door is designed to open on the front to allow easy entry/exit for your pet. Lightweight, well ventilated and easy to clean, this carrier is suitable for carrying small to large sized cats, small dogs and other small animals. Expandable Shoulder Carrier For Small Animals. Take your cat or small dog/animal where ever you go. Maybe you don't have a car and need to take your pet to the vet, or maybe you just want to get out and about with your small friend. Lots of venting with zippered closure to keep the pet secure. Fabric: Polyester with nylon lining. Zipper top closure. Removable floor pad. EXTRA SECURE TOUGHENED PLASTIC CAGE. 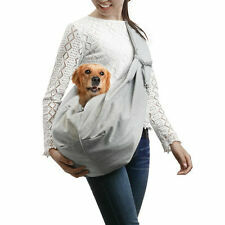 PORTABLE PET CARRIER. 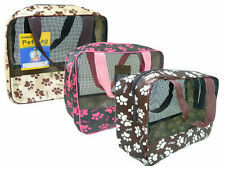 THE PORTABLE PET CARRIER HAS VENTILATION SLITS PLUS REMOVABLE CLEAR PLASTIC FLAP/ENTRANCE. ACCESSIBILITY: GATED CLEAR PLASTIC FLAP. ALSO HAS A SAFETY BELT SLOT FOR 'ON THE GO' TRAVEL. 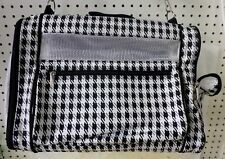 YOU ARE PURCHASING A BRAND NEW WITH TAGS PET CARRIER SOFT SIDED FOR CAT/DOG. SECOND PICTURE SHOWS INSIDE WHERE THERE IS A PIECE OF CARPET ON THE BOTTOM OF THE BAG. 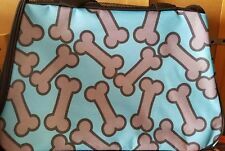 DESIGN IS BLUE & GRAY WITH DOG BONES. FOR SMALL DOG UP TO 11 POUNDS. Reversible design multifunction two-way. Pet lovers will love these reversible sling pet airways.Machine wash cold water is available.Specifications 1 Pet Sling Carrier Bag. Reversible: the pet punching bag not only convenient but also looks good. The semi-sphere window design provides your pet a more interesting and safe space, which allows your pets to enjoy the sunshine and scenery with you and interact with the outside world. Bought online for my kitty, but never used it. Perfect for walks with your fur baby! Plastic nuts have three wings to easily loosen and tighten with your fingers (no tools needed!). Set of 12 pairs of black plastic nuts and steel bolts (12 nuts, 12 bolts). Fit most carriers: shaft of bolt is 5 mm, so will fit with holes between 5 and 8 mm. plastic with handle ventilation slits for ideal air circulation Capri 2 with storage tray and stroking flap . PET TRAVEL CARRIER TRANSPORT BOX CAGE KENNEL – SMALL. SUITABLE FOR SMALL PETS INCLUDING DOGS PUPPY CAT KITTEN RABBIT. Simple to assemble (base and top sections clip together with quick release buckles). Help your pet arrive safely and in style with this soft-sided pet carrier. The pet carrier features front and top openings, which allow for effortless entry and stress-free loading. A zipper on the front and double zippers on the top keep the openings securely closed during transport.